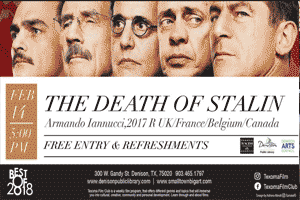 “The comedy of cruelty is rarely funnier or more brutal than when it comes from Armando Iannucci, a virtuoso of political evisceration. A comic talent who should be household famous, he is best known for “Veep,” the HBO series about Washington politics that was a satire when it first hit in 2012 but now seems like a reality show. He also directed the movie “In the Loop,” an aptly obscene burlesque about the run-up to the Iraq War. He only seems to have abandoned contemporary politics in his latest, “The Death of Stalin,” an eccentric comic shocker about a strong man and his world of ashes and blood. The laughs come in jolts and waves in “The Death of Stalin,” delivered in a brilliantly arranged mix of savage one-liners, lacerating dialogue and perfectly timed slapstick that wouldn’t be out of place in a Three Stooges bit. Turning horror into comedy is nothing new, but Mr. Iannucci’s unwavering embrace of these seemingly discordant genres as twin principles is bracing. In “The Death of Stalin,” fear is so overwhelming, so deeply embedded in everyday life that it distorts ordinary expression, utterances, gestures and bodies. It has turned faces into masks (alternately tragic and comic), people into caricatures, death into a punch line. Taken from: “Review: The Slapstick Horror of ‘The Death of Stalin’”, written by Manohla Dargis, for The New York Times, March 8, 2018.